Internet of Blockchains (Web 3.0): blockchain projects that could challenge or replace current Internet giants. Bear markets are a time for research and re-assessing current holdings. 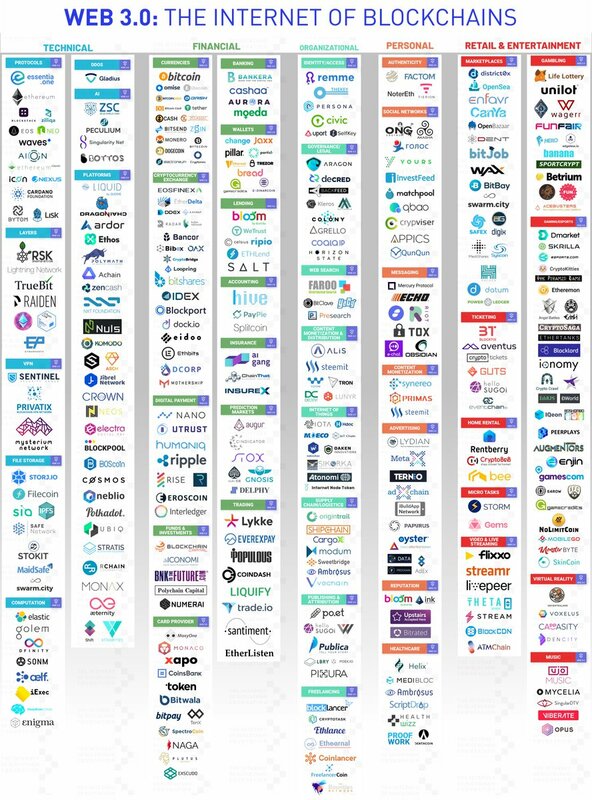 I found this infographic and article posted today by @ZagoMatteoGian (on Twitter) extremely useful to identify which projects could emerge in the next bull market and with potential to challenge or even replace some of the current Internet giants. It's self evident how many of the services we use today on the Internet (search engine, social media, storage, exchanges, etc) could benefit from moving to the blockchain or other trust-less decentralized solutions. However keep in mind 90% of these blockchain projects will likely fail, so it's also key to research if these projects have the teams, the expertise and resources to deliver working and useful products. After going through most of them I can only count about 10-15 I'm comfortable with investing in. As always DYOR (do your own research!). PS: @ZagoMatteoGian is the founder of Essentia.One (that's why it's at the top in the graphic) and his project aims at uniting all the blockchain projects into an Internet of Blockchains (Web 3.0). A concept I believe similar to Wanchain.